Hello everyone! This is GiGi from The Circut Bug here and I am sharing this fun treat tube. 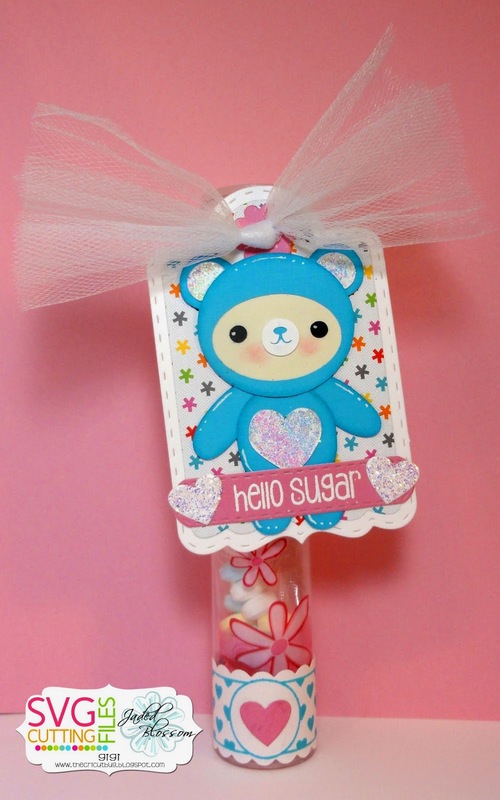 I used the new SVG Cutting Files Beary Sweet Sprinkles Bear as the highlight of this fun tag. She will be available in the store on Friday. Here's a closer look at this adorable tag. I filled the tube with a candy necklace. The wrapper for the necklace turned out to be an added decoration to this project. I heat embossed the sentiment onto the tag and also added some die cut hearts that I glittered up. I tied it onto the tube using some tulle. At the bottom I added the wrap that I stamped with the heart design and I added another die cut heart to the center. This is really adorable and so colorful! TFS!